Andromeda seems to be a relatively new company, specializing in releasing live recordings (often broadcasts) that are out of copyright. They operate much along the lines of Walhall with a minimum of documentation; in this case a cast-list and a track-list and that�s it. On the front cover it says �Newly remastered using state-of-the-art restoration techniques� but no mentioning of the restorer. Whoever he is, he has done a good job. Presumably the original tapes were in good shape, for the orchestra sounds well with fine reproduction of the brass in the prelude. The chorus is also mostly well caught. This unfortunately reveals that the male voices are not very distinguished - the chorus of monks right after the prelude is nothing to write home about. When they are joined by the female voices, notably in the auto-da-f� scene, we get a more homogeneous choral sound, but of course this impressive music is not easily reproduced through a fifty-year-old live mono recording. When it comes to the solo singing the sound varies a lot, depending on how and where the singers are positioned on the Met�s large stage. The trio in act two (CD1 track 23), to mention just one example, is oddly balanced: Eboli is very close to the microphone and Rodrigo seemingly very far back. Since this is the four act version, listeners used to the five act original will miss the whole first act, bar the tenor aria which is inserted as Carlo�s entrance in what here is the first act. There are also some cuts within numbers. Eboli�s Song of the Veil, Nei giardin del bello (CD1 track 8) is shorn of its second stanza and there are others but as a whole this set gives a fairly good representation of this great work. 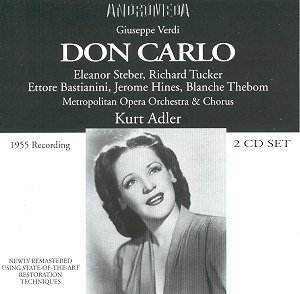 With these cuts plus Kurt Adler�s generally brisk tempi the opera has been shoehorned into just two discs. I compared this with my reference recording, Giulini�s EMI version from 1970, now in the Great Recordings of the Century series. The Giulini with more measured tempi offers almost a full hour of extra playing time, half of which is of course the missing first act. Generally speaking Giulini digs deeper into this wonderful score and his soloists are also preferable in most cases. Add to this a quality of sound that is still excellent and the EMI set can be confidently recommended to anyone wanting a library version. It is a set one can return to over and over again and each time find new insights. As for the set under scrutiny most opera lovers will probably be interested in it for the sake of the soloists, several of whom are not especially well-represented on commercial recordings. The cast list is indeed impressive with four home-grown American singers in leading parts (all right, Blanche Thebom has Swedish ancestry). We also hear possibly the best Italian baritone vocally during the whole post-war era. Ettore Bastianini, aged 40 or thereabouts. In the early sixties he went on to record for DG the role of Rodrigo in the first commercial recording of the five-act-version. I have for more than forty years admired his singing there although he sings even better in this early recording. With hindsight I suspect that the hardening of his sound in the 1960s might have been due to the throat cancer that was to end his life a few years later. Here though he is at his very best and produces effortless singing with his nut-brown, steady, evenly-produced and classy voice. He is fine in the first scene in the famous duet with Carlo, where one gets the feeling that he and Tucker are trying to out-sing each other; two glorious voices rarely singing below forte. He is even better, and more nuanced, further on in his Carlo, ch�� sol il nostro amore (CD1 track 11) and also the long scene with Filippo (CD1 tracks 16-20). Best of all is the prison scene (CD2 tracks 14-17) where he reaches Everest and pours out a stream of warm golden tone, Per me giunto; unquestionably the highpoint of this recording. Richard Tucker shows off his brilliant top notes to good effect and he is an eager, intense Carlo. He is also lyrical and elegant (CD1 track 22) reminding the listener that he actually started as a cantor and early in his career sang a great deal of Mozart. Jerome Hines, who sang at the Met for 35 consecutive seasons in more than 800 performances, has a warm, dark voice, readily expressing authority but also delivering a deeply felt and involved Ella giammai m�am� (CD2 track 5), maybe overdoing the end of the aria but generally it is a fine performance. The following scene with L�Inquisitore also shows him in a good light, while Nicola Moscona, another Met stalwart is rather hollow-sounding and shaky (well, he is supposed to be ninety! ), but he characterizes well. Blanche Thebom, after a rather throaty start, grows through the performance, but there is a certain squalliness about her singing that bereaves her portrait of much of the sexual allure that Eboli should radiate. Her final appearance with the aria O don fatale (CD2 track 13) redeems much of what she did earlier and some suspect intonation apart it is intense and probably also visually exciting, judging from the applause. Involved is also a suitable description of Eleanor Steber�s contribution to this performance. Elisabetta is of course all through the opera - at least in the four-act version - a deeply unhappy woman and her fluttery tone underlines this. Unfortunately this flutter becomes rather wearing on the ears and there is very little beauty in her singing. Her big last act aria is well interpreted, apart from the end which is rather over the top, but it isn�t a lovely performance vocally speaking. Luckily towards the end of the duet with Carlo, at Ma lass� ci vedremo (CD2 track 23) she finally finds a more pure, silvery tone, which is quite attractive. I can�t think that this will ever be someone�s first choice of Don Carlo, but admirers of Ettore Bastianini should definitely search it out and there is enough of good singing elsewhere too to make it a fairly attractive proposition.